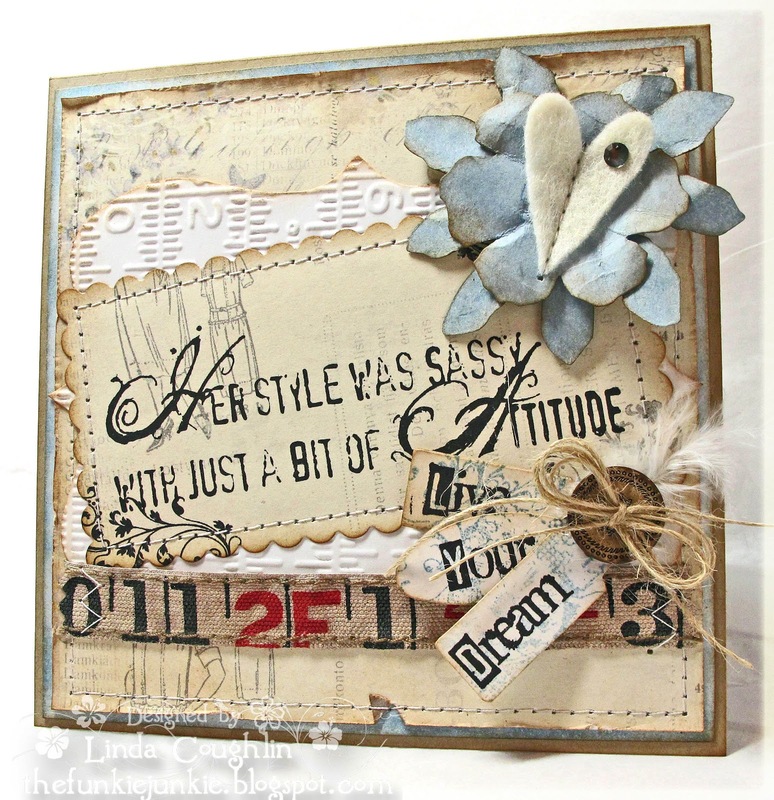 Welcome back to the second installment of inspiration from the Our Creative Corner team! Thank you so much to all of you who have taken part so far in our 'Anything Goes' challenge. There has been an amazing response and all the team have had so much fun visiting you all and seeing what wonderful creations you have shown us. The first two weeks of the challenge started with half of the team showing you some creations to lead you on your way down your own creative path - Now the rest of the team are here to provide you with even more inspiration! I am sure you are impatient to see what has made for you to view here today...so no more talk from me!....I present to you the fantastic creations from the Our Creative Corner design team! I created a vintage style booklet, telling about yet "untold" stories that may have happened that way in historic places but have never been told (as I believe it is the people who have been to them that "write" the stories and not the places themselves). And in a certain sense of the meaning we write history every day, don't we? Therefore I tried to keep the pages stories rather sketchy - so there is room for imagination and poetry. 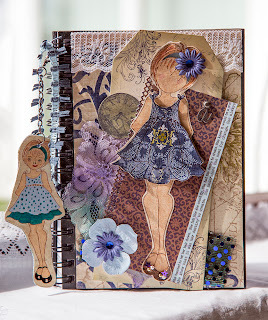 I have a passion for and am totally inspired by all things Tim Holtz and Wendy Vecchi. I made this piece for a very special friend, for whom the words are totally appropriate. I was in a girlie mood and wanted to use some of my lovely Pion Design paper. I also pulled out an old goodie Wendy Vecchi stamp set to use for the sentiments. 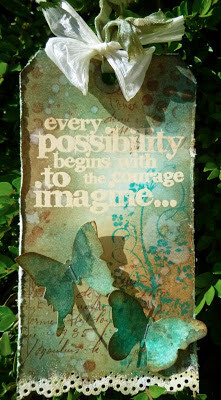 This tag was the result of an impromptu crafty tutorial session for a friend completely new to crafting. I was just grabbing anything to show her what was possible, and she followed along with her own version. So it's got Distress Inks, Stains, stamping, embossing, wrinkle-free distress technique, spritz and flick, die-cutting, punching, and ribbon dyeing - a bit of everything and anything, and I ended up really loving it - so it seemed perfect for Anything Goes! The winner and Top 3 from this challenge will be announced on the 8th June. The winner will be invited to appear as 'The Top Talent' here at OCC, have a short interview so we can find out all about them and there will be a 'Spotlight' on a new project they have created. The winner's Top Talent interview and creation will be on the 22nd July. Make sure you are here next month to find out what our next challenge will be - Jenny will be here on the 1st June to announce her challenge. Come and see what surprises are in store for you and where your next OCC challenge journey will take you! What will inspire you in the marvelous month of May? There are no limits in the land of 'Anything Goes' and we can't wait to see the entries! Whether your crafting passion is making Tags, Altered Art, Mixed Media, Journaling, 3D art, ATC's, Cards - We would LOVE to see you enter them in our challenge. Use whatever you want, however you want - Let your creativity flow! There is only one way to get your badges and have your name placed forever in 'Winners Corner' - Enter the challenges! Remember, there are more DT creations to come. So please come back on the 15th of May for more wonderful inspiration! I decided to go with my usual Shabby Chic tag in faded dusty pastels. 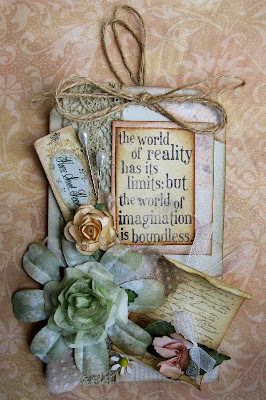 It is always so lovely working in lovely delicate vintage shades and also to add lots of flowers, ink, stamps, ribbons, lace, layers, torn paper and, of course, the essential - an inspiring sentiment. For my very first Design Team project, I decorated this journal for a new crafting friend who is just 9 years old but has aspirations as a dress designer. 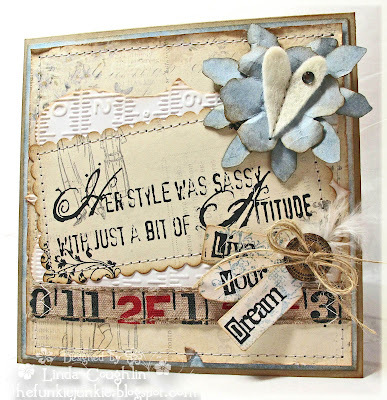 I was longing to use the new Julie Nutting mixed media doll stamp mixed with some vintage scraps. I've been learning mixed media and paint techniques with Andy Skinner and this is a club piece I finished recently. I think you'll either love him or hate him but he makes me swoon! The starting point was a plain bisque figure (cream coloured) designed by AS then many layers of Americana paint and Decoart mediums later, this is how he ended up. 1. You may enter each challenge a maximum of THREE times - but they must be different creations and posted on your blog separately. 2. If you post too many entries then they will sadly have to be deleted. 3. NO backlinking. Please do not enter a creation that was published on your blog before our challenge start date. 4. Please link to your actual post - not your blog. 6. You may combine our challenge with as many other challenges you wish. 7. If you want a comment from the Design Team then your entry has to be a link to a site that does not require us to become a member to sign in.